We casually refer to “the stock market” all the time. And whatever the Dow Jones, the S&P 500, and the Nasdaq are doing is generally accepted as how “the market” is doing. But there are about 3,600 publicly traded stocks between then NYSE and the Nasdaq. Drilling deeper into market internals tells us what the market is really made of, the true structure and state of its underlying integrity, as opposed to the cursory snapshot that the indices provide. 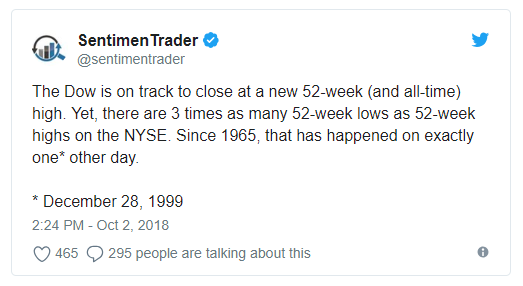 So how well is a market really doing when three times as many stocks are trading at their lowest levels in a year as compared to those trading at 52-week highs? 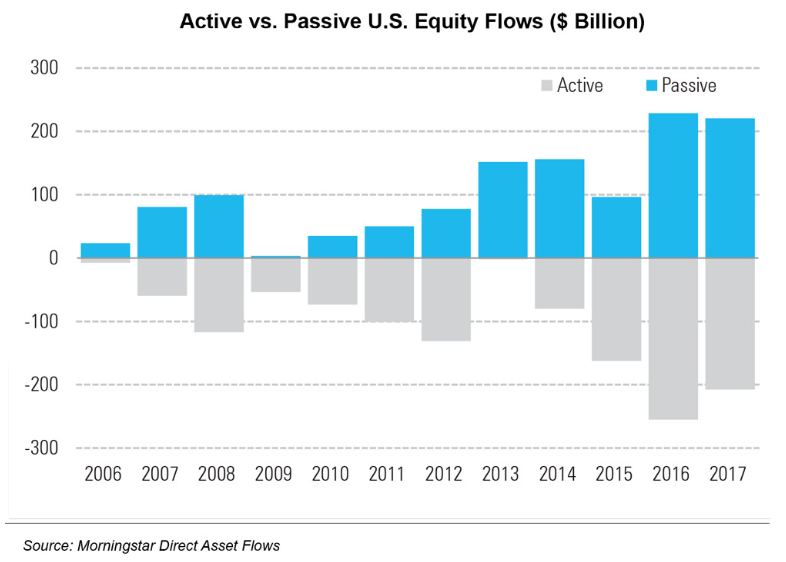 As investors started to realize that they were getting fleeced paying for active management of mutual funds that routinely underperformed super-low-fee index funds, there was a sea change in individual investor behavior, as seen in the above chart. The mechanics of that are important. Take the huge inflows that have moved into S&P 500 Index funds. That means that 500 individual stocks have seen blind, persistent buying. And not a penny of those index fund inflows went to 3,100+ other publicly traded companies. As of July, Amazon, Netflix, and Microsoft – three of 500 stocks – were responsible for 71% of the S&P 500’s annual gain. So when you hear how “the market” is at record highs and how “the market” is doing so well, what people are really referring to is a narrow slice of the market as a whole. Fully three times as many companies that make up “the market” are at their lowest price levels of the past year vs. those that are at their highest. Will the new Dow high in the face of so many NYSE 52-week lows serve as timely a predictor of market collapse as it did in 1999? Time will tell. If it does, a major inflection point is close at hand, and the days of bargain-basement gold and silver prices are numbered.